If you handle Mails in PHP they sometimes have a 8bit strings looks like =3D or =0A or =0D etc. when trying to get the plain text mail out of a HTML mail for example. The PHP engine brings a built-in function called quoted_printable_decode() to decode such strings and get the plain, normal looking mail in return. the url of where the .js file is. Another random mail line is here. It's exactly how its supposed to be according to the manual except I changed the url of where the .js file is. This code would be the source. Thanks! 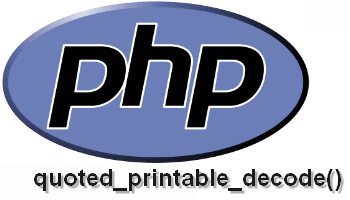 Check out more helpful PHP tutorials or share this page on social media to help others.